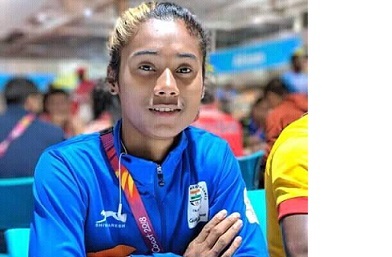 Sprinter from Assam Hima Das drew the attention of the world again by finishing the women’s 400 m race of the Asian Games 2018 at 51 seconds, breaking her personal record, in Indonesia’s Jakarta and entered the final on Saturday. Hima stood second while Bahrain’s Salwa Eid Naser remained on top by finishing at 50.86 seconds. The final of the women’s 400 m race of Asian Games 2018 will be held on Sunday. It has been reported that it would be tough for Hima Das to clinch gold in her first Asian Games unless Bahrain’s Salwa Eid Naser goofs up big time. Naser, who hails from Nigeria, is the 2017 World Championships silver medallist and has won four legs of the prestigious Diamond League Series in 2018. Before going to the tracks of Asian Games, a confident Hima Das sought blessings from the people of Assam. On the other hand, Salwa Eid Naser’s best timing is 49.08 seconds while finishing second in the Monaco leg Diamond League Meeting last month, which is the Asian record and second-leading time in the world this season. Enlivened by the “outstanding” performance of sprint queen Hima Das Union Sports Minister Rajyavardhan Singh Rathore said recently that a games period would be made mandatory in schools after reducing the syllabus by 50 per cent next year. The Chief Minister of Assam, Sarbananda Sonowal, had also congratulated the 18-year-old sprint queen.